Las Vegas is home to some of the most elaborate and luxurious hotels in the world. Whether you’re looking for a themed or modern experience, there’s a Las Vegas hotel for you. Hot Shot Vegas is the premiere Las Vegas VIP hosting & hotel booking company in Las Vegas. Our years of working and living in the city have helped us establish unmatched relationships with Las Vegas hotels, casinos, nightclubs and other local businesses. It’s these strong ties to the community that help us provide our clients with the best prices on everything from Las Vegas bottle service packages to Las Vegas hotel room rates. Book your hotel room through Hot Shot Vegas and save on nightly room rates or get upgraded to enjoy a suite or strip view room. Book your trip today. With so many amazing Las Vegas resorts to choose from booking a hotel can be a daunting task. To pick the right Las Vegas hotel consider the type of experience you’re looking for. If you’re looking for a Las Vegas themed hotel, consider casinos like the Mirage, Treasure Island, New York, New York, or Paris. Most Las Vegas hotels have themes, but these hotels take themed décor to the next level. At the Mirage hotel & casino you’ll be surrounded by Polynesian luxury. Experience a live volcanic eruption on the front lawn, or walk through the botanical gardens. The lobby also immerses guests into the jungle experience with lush tropical gardens and waterfalls. At Treasure Island Las Vegas, guests experience what it’s like to live in a town overrun with pirates. The lobby has been designed and decorated much like the pirate city of Tortuga. In front of Treasure Island sits Buccaneer Bay which features nightly pirate battles and a large pirate ship. With hundreds of slot machines and tables to choose from, you could walk away with a pirate treasure of your own. For those who’ve dreamed of experiencing the bright lights of New York City, you can do so without having to take the long flight to the East Coast. The entry way to New York, New York hotel provides guests with a view of the New York City skyline, equipped with scaled models of some of the city’s most famous buildings. The towers are named after famous structures like the Chrysler and Empire State Buildings. The lake in front of the hotel represents the New York Harbor. You can even visit Grand Central Terminal in the hotel. The hotel also offers entertainment in the way of a roller coaster which provides adventure seekers with an adrenalin rush and great view of the strip. The Paris Hotel & Casino in Las Vegas transports guests to the city of romance. Besides a scaled version of the Eiffel Tower, the Paris hotel also featured versions of the Fontaine des Mers and the Arc de Triomphe. The lobby transports guests as well with cobble stoned flooring and a ceiling reminiscent of the skies over Paris. Take a ride up the Eiffel Tower and enjoy a spectacular view of Las Vegas. If themed hotels aren’t your thing, there are plenty of modern hotels to pick from. The Cosmopolitan Las Vegas is a blend of modern architecture and luxurious design. The chandelier bar ads romance to this otherwise very modern casino. The Aria and Vdara hotels are also great options for those looking for a modern hotel on the strip. Luxury is abundant on the strip, but perhaps no one does it better than Steve Wynn. 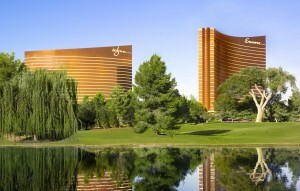 The Wynn hotel is modern elegance. Guests enjoy beautiful floral displays, white marble flooring, gold accents, lush botanical gardens and a waterfall. For Italian luxury book your stay at the Bellagio. Have dinner by the beautiful lake and enjoy the famous Bellagio fountain show. No matter what hotel experience you seek let Hot Shot Vegas be your preferred Las Vegas Destination Management company. Let us book your Las Vegas hotel and save on nightly hotel rates. Request a free quote now or contact us directly. Don't forget, if you find a rate lower online - We'll match and give you $50 bucks! We guarantee our rates!